Free Comodo AntiVirus ? Eliminates all known viruses, worms and trojans from desktops and networks. Comodo AntiVirus - Eliminates all known viruses, worms and trojans from Windows computers. Features on-demand & on-access scanning, email scanning, process monitoring, worm blocker, scan scheduling and more. It?s easy to use; will not slow down your PC and is free for life to the end user.Specifically engineered to deliver the very highest protection, Comodo AV boasts an industry leading feature list that's packed with the latest and most sophisticated technologies. Detects and eliminates viruses from desktops and networks Constantly protects with real-time On Access scanning online Proactive Heuristic analysis intercepts unknown threats Daily, automatic updates of virus definitions Isolates suspicious files in quarantine preventing infection Full inbound and out bound E-Mail scanning Simple to use: install and forget Updated virus definitions are automatically downloaded according to a schedule of your choice or by a single click on the 'updater' button. 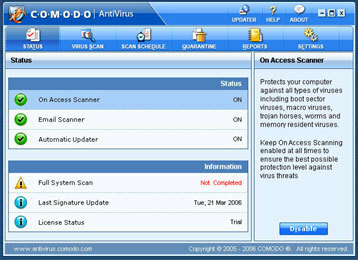 Once installed, Comodo AntiVirus will unobtrusively sit in your system tray, silently and efficiently defending your system from the latest virus outbreaks.Unlike the stripped down versions of commercial software that other software vendors offer for free, this is the full, completely functional version of the product. Free Lifetime License - After downloading and installing Comodo AntiVirus, just register with us and you will be sent a free license. After activation, this license will never expire.